The City of Copenhagen's biannual Cycle Report [the link is to a pdf and it's in Danish] is a goldmine of great statistics regarding our bicycle culture. Even though our bike infrastructure is highly-advanced, the City is constantly revising and reviewing all the issues regarding integration of bikes in the streets. It is an ongoing, long-term affair. Bikes have equal access everywhere in the city, but there are as a rule dedicated bike lanes on most roads with traffic. When Copenhagen builds new bike lanes on a stretch of road, there is a bicycle traffic increase of 20% and a 10% decrease in car traffic. Bike lanes subsequently increase cyclists' safety and perception of safety, encouraging them to ride more. The flipside of this is that there is a tendency for more accidents at intersections. The use of blue painted bike lanes across intersections is on the rise, as they help cyclists and motorists see the bike lanes. 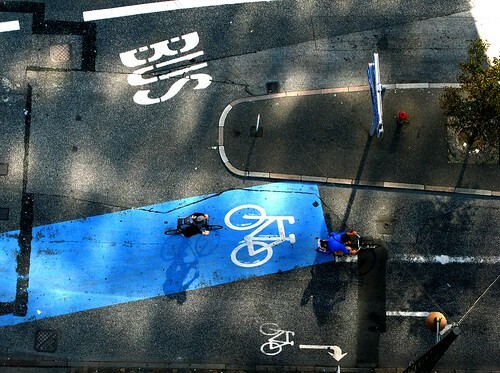 Having one blue painted strip of bike lane leading across an intersection is shown to increase safety. The primary challenge is ensuring that cyclists are visible to motorists at intersections and, on the other side of the coin, that cyclists are aware of the motorised traffic. One way of increasing this common awareness is to place the two parties closer together in the traffic. Another way is to place the cyclists physically in front of the cars at intersections – something that can be achieved by merely moving the stop line for cars back 4-5 metres. The cyclists at the stop light will be more visible, especially for motor vehicles turning right. The statistics show that the number of bike accidents resulting in death or serious injury continues to fall year by year. In 2004 there were 124 accidents causing death or serious injury and in 2006 there was 92. The number of deaths is roughly 6 per year and the City regards a reduction in these numbers as a primary goal. 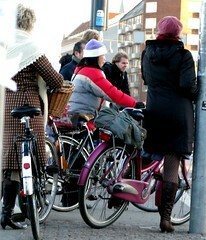 It's worth noting that more pedestrians lose their lives in Copenhagen each year than cyclists. For the sake of perspective. 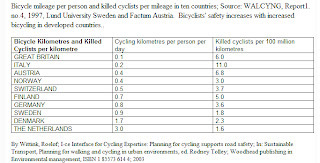 In comparison, Melbourne, Australia has over 200 serious injuries a year – a city with far, far less cyclists than Copenhagen. The constant reduction of this statistic over a 10-year period shows that it is possible to drastically reduce the number of serious bike accidents. One of the most important factors is that an massive increase in bike usage causes the number of accidents to fall sharply. More bikes on the roads means less accidents. This report is ten years old, but it shows the tendency. We have mentioned before the coining of the phrase ”Copenhagenizing a city” - meaning the construction of dedicated and segregated bike lanes. It is also known as giving a city ”the Copenhagen Treatment”. Here's a link to an article in the Melbourne Age about that city's investment in the Copenhagen Treatment. Not everyone is thrilled about new bike lanes or increased bike usage. It is often a bit shocking to read about this anti-bike sentiment. Read the message posted under this article in the Edinburgh News. Although the agressive tone is also seen in some posts by cyclists. And this post from the cool blog Seeing Green about some residents protesting against bike lanes on 9th street. Which I found on this groovy post. Do let us know about any initiatives where you are. We're always interested to hear about them. tags: "bike commuting", "bike culture", "bike infrastructure", "bike statistics"